The Pitt Rivers Museum often loans objects to other museums, both in the UK and abroad. During transit, installation and removal, a member of Pitt Rivers Museum staff is present making sure the objects are looked after. 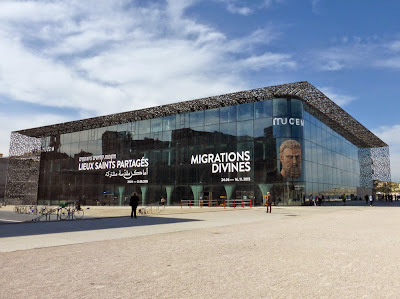 The Musée des Civilisations de l’Europe et de la Méditerranée (MuCEM) in Marseille has a temporary exhibition entitled Lieux Saints Partagés ('Shared Sacred Sites'). Staff from MuCEM came to the PRM to select candidates objects in summer 2014 and earlier this month I couriered the loan of 14 amulets to Marseille. The amulets were checked and prepared by Kate Jackson, Conservator at the PRM. Kate took photographs and recorded the condition of the objects before their journey, then mounts were made to keep the fragile object secure in transit as they were packed into a small carry case. I flew to Marseille and the carry case was secured in the aeroplane seat next to me. At MuCEM the other objects and art works of the exhibition were also being installed - objects exploring the nature of holy sites of shared significance among different religions around the Mediterranean. The loaned amulets derive from Jewish, Christian and Muslim traditions, made in continental Europe, north Africa and the near East. They are all part of a large collection made by Adrien de Mortillet, which was the focus of our recent Small Blessings project. Twelve of the Pitt Rivers amulets were put in a display case together. 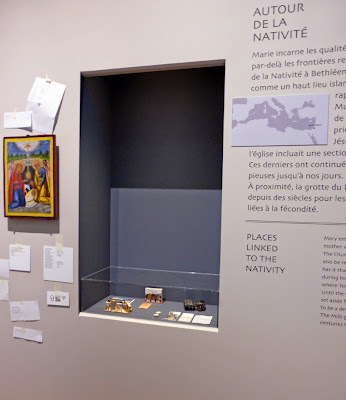 The other two were displayed in a case with other objects from the Milk Grotto in Bethlehem. These two circular tablets are made of white clay. One side is impressed with a geometric motif, the other side shows a feint figure of the Virgin Mary holding the baby Jesus. According to legend, Mary was nursing baby Jesus in the grotto when a drop of milk spilled onto the ground and turned it white. This miracle led to the belief that dust and clay from the grotto, which is made of limestone, can enhance fertility and improve a motherʼs milk. Although tablets of clay like these ones are no longer sold, the Franciscans who oversee the shrine still prepare small packets of limestone powder to give in return for a small donation. They instruct that both husband and wife should drink the powder mixed with milk or water for nine days, and recite the prayer for the Third Joyful Mystery of the Rosary which recalls the birth of Jesus, known as the Nativity. MuCEM was built for 2013 when Marseille was European Capital of Culture. 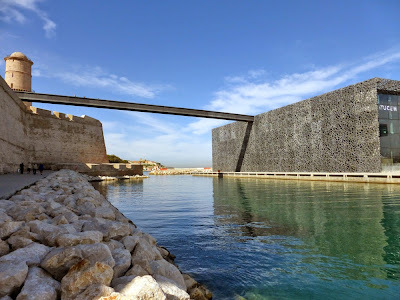 Marseille is a historic port city and a modern meeting place for Mediterranean cultures which makes it an entirely appropriate place for an exhibition such as this. The exhibition is on until 31 August 2015.
mess or do you need funds to start up your own business? Today I am a happy man, although being into politics is very stressful but we never give up until the battle is over. I just want to quickly use this medium to say a big thanks to Anthony Weslie Loan Company for making my race a success. I never thought I could get such a huge amount of loan, but this company gave me the loan without any stress. My success came as a result of the loan I took from this company. The CEO Mr. Anthony Weslie, I use this medium to say I owe you a lot. Thanks and God bless you sir. In case you are out there, you are financially stocked up, and you need a loan to relief you of your financial stress I strongly recommend you to Anthony Weslie Loan Company. You can contact them directly through their website www.anthonyweslieloancompany.simplesite.com or email them at anthonyweslieloancompany1@gmail.com God bless you all.